Almost 20 years ago, I was fortunate to be invited to my first Bioquest Workshop at Beloit College. 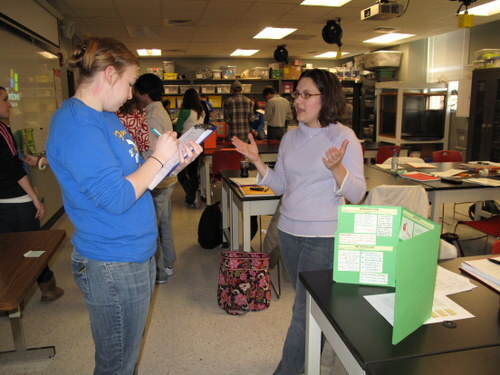 Maura Flannery covered the Bioquest experience in several her columns in the American Biology Teacher. These workshops challenge and inspire you as you work with a number of like-minded biology educators working on the edge of new developments. What really caught me off guard was the intensity of the learning experience. Before the end of the first full day, each working group had to produce a scientific poster presentation. This was my first, personal experience with building a poster so I’m glad that I don’t really have a record of it. I talked to John Jungck about the poster requirements—he told me that the students in his labs prepare a poster for each laboratory–rather than a lab-write up and they have to defend/present them in poster sessions. I immediately saw that a poster would help me evaluate my student’s lab experience while provide a bit of authenticity to my students doing science. That fall I had my students do a poster session that was displayed in the science hall. It was a big success with one exception. For my high school class, the experience was a bit too intense and too time consuming. It turned out that we could only work in one big poster session that year. One of the little bits of clarity of thought that comes from teaching for decades instead of years is the realization that students need to practice, practice, practice—doing anything just once is not enough. I thought about abandoning the poster session since it was too time consuming. However, I witness great learning by all levels of students with this tool. I didn’t want to abandon it. With this thought rolling around in my mind, I was primed as I visited one of my wife, Carol’s, teacher workshops. She’s a science teacher, too. 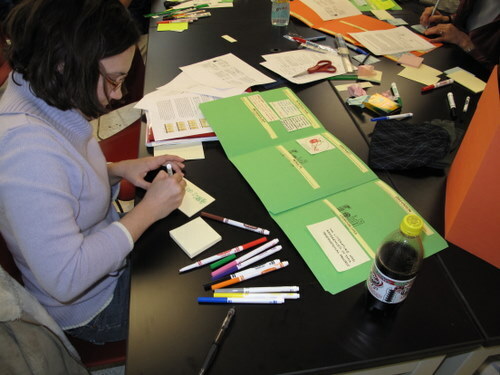 In this workshop she was presenting an idea to help elementary teachers develop science fair project—a mini-science fair poster. This idea involved the used of a trifolded piece of 11″ x 17″ paper. The teachers were inputting their “required” science fair heading with post-it notes. Revision was a breeze. The teachers learned the importance of brevity with completion. They added graphs and images by gluing their graph to a small post-it. It was all so tidy, so elegant, so inviting, I probably stared a little long, struck dumb by the simplicity of the mini-poster. 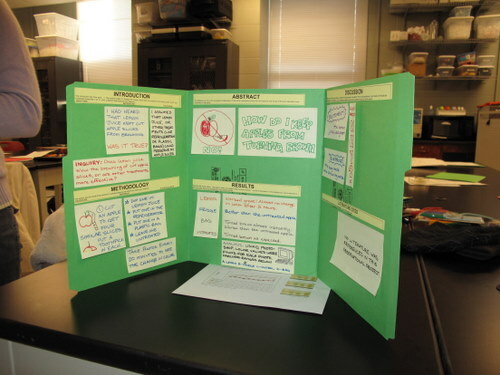 Once I came to my senses I realized that the mini-poster was my answer–a way to incorporate authentic peer review, formative assessment in my science classes. My high school classes could be like John’s college classes. Over the years, mini-posters have evolved into the following. We take two, colored (for aesthetics file folders, trim off the tabs and glue them so that one panel from each overlap—leaving a trifold, mini-poster framework. Each student gets one of these. For these posters we go ahead and permanently glue on miniposter-headers that include prompts to remind the students what should be included in each section. Later, they can design their own posters from scratch. The image at the top of the page and the ones following will give you an idea. By using post-it notes the posters can easily be revised and we also reuse the poster template several times over the year. Don’t feel that you have to follow this design–feel free to innovate. For the first mini-poster experience, I give my students as much as a class period to work up a poster after completing an original research investigation. (We do quite a few of these early in the school year with others periodically throughout the rest of the year). Sometimes poster work is by groups and sometimes by individuals. Once the posters are ready, the class has a mini-poster session. The class is divided up in half or in groups. Half the class (or a fraction) then stays with their posters to defend and explain them while the other half play the part of the critical audience. To guide the critic, I provide each “evaluator” with a one page RUBRIC and require them to score the poster after a short presentation. I restrict the “presentation” to about 5 minutes and make sure that there is an audience for every poster. We then rotate around the room through a couple of rounds before switching places. The poster presenters become the critical audience and the evaluators become presenters. We then repeat the process. 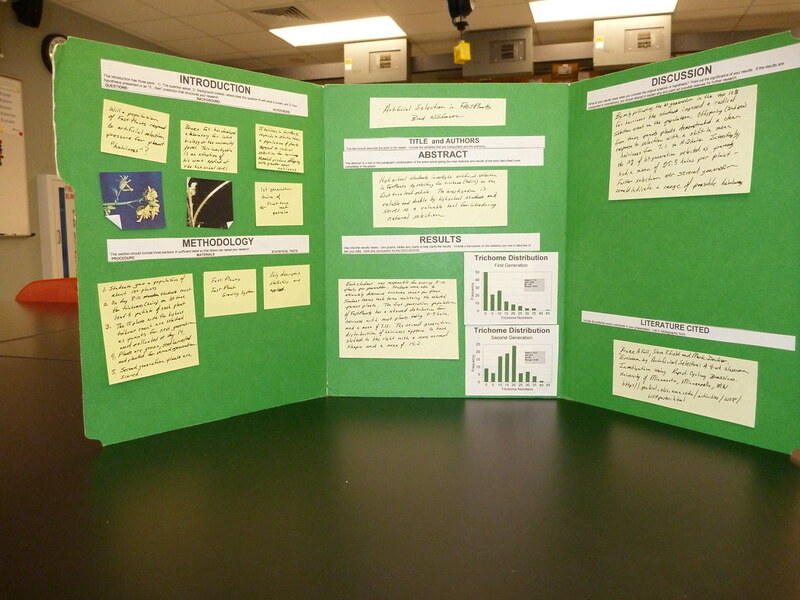 By the end of the hour every poster has been peer-reviewed and scored with a rubric–formative assessment at its best. The atmosphere is really jumping with the students generally enjoying presenting their original work to their peers. The feedback is impressive. At this point I step in and point out that I will be evaluating their posters for a grade (summative assessment) but they have until tomorrow (or next week) to revise their posters based on peer review—oh, and I’ll use the same rubric. The process works very well for me and my students and my guess is that it will for yours as well. You’ll naturally have to tweak it a bit—please do. If you find mini-posters work for you, come back here and leave a comment. The images are from our UKanTeach Research Methods course first assignment—a weekend research investigation. Thanks to the Research Methods course for the images. Here’s a file that illustrates what a Sample-miniposter might look like constructed in MS Word.